Eden Atwood was discovered by pianist Marian McPartland in 1993 and became the youngest artist ever signed to Concord Records. 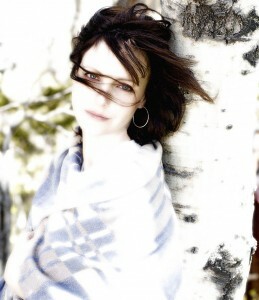 A musician, mother, social worker, and social justice activist, Eden is passionate and multitalented. She sings Jazz standards, Bossa Nova, ballads, and Blues with her “uncommonly rich vocal palette” on her ten albums. “Smooth, saucy, seductive, or soaring, cool, coy, plaintive or just plain down and dirty, she can do it all” (Edwin Dobb, Harper’s Magazine). Performing with her is pianist Dana Landry, percussionist Dru Heller, and bassist Erik Applegate and opening is Colorado Conservatory for the Jazz Arts’ Jazz Messengers. Music Appreciation Society invites lovers of great music to a very special evening with Eden Atwood. Eden Atwood was born in Memphis, TN in 1969. She began to sing at the same time she began to speak. Eden’s first live performances were onstage at Shakey’s Pizza Parlor at age 3. Despite various career turns, she has not left the stage since. Eden’s father, Hub Atwood, was a writer and arranger for the likes of Frank Sinatra, Harry James, Stan Kenton and Nat King Cole. Her mother, Helen “Gus” Guthrie, the daughter of Pulitzer Prizer winning author, A.B. Guthrie, Jr., made a name for herself in book publishing. By 15, Eden was fronting a busy band comprised of musicians twice her age. Eden moved to Chicago at age 19 after the sudden death of her father and studied theatre and music. Soon after, Eden became the headliner of Chicago’s legendary Gold Star Sardine Bar. She would stay for eight years with breaks to accommodate her acting and modeling jobs in New York, Los Angeles and Paris. 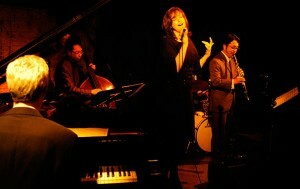 Eden has performed all over the world sharing bills with Gene Harris, Joshua Redman and Toshiko Akiyoshi Big Band. She has been featured on NPR’s Piano Jazz with Marian McPartland and Ms. McPartland appears on three tracks of Eden’s CD ‘There Again’. In 2001, Eden signed with Groove Note Records and released ‘Waves, The Bossa Nova Session,’ a recording of Bossa Nova standards and Brazilian flavored standards from the Great American Songbook. And in 2003, Eden released ‘This Is Always, The Ballad Session,’ featuring the soulful Tom Harrell on trumpet and flugelhorn. One week after the recording session for “This Is Always,” Eden became a first time mother to her son, Ben. Most recently, Eden recorded three CDs for SSJ Records Japan, ‘Turn Me Loose,’ ‘Like Someone In Love’ and ‘Angel Eyes.’ ‘Turn Me Loose’ won a Silver Award from Swing Journal Japan for Best Vocal Album of 2010 and ‘Angel Eyes’ won a Gold Award for Best Vocal Album of 2012 from the same publication. Her latest release, “I’m Glad There Is You – The Best of the Concord Years” (2016) is a 14 song compilation of her younger years. “The music of this era speaks to me more than any other. It’s my history, my heritage and the legacy my mother and father bestowed upon me. There is sweetness in my earnestness that time and distance allow me to hear and appreciate. I was in my twenties when I recorded these songs. Far too young to fully understand what I was singing about. I sing these songs differently now and, generally, about a fourth lower. I have experience and maturity and wisdom that no twenty-something has. And I still have much to learn” (Eden Atwood). In 2013, Eden graduated the MSW program from Walla Walla University and in August 2016 became an LCSW. Eden has been working as a clinical therapist for the past three years working with at risk and emotionally traumatized teens. Eden also maintains a private music studio. Eden is currently at work on her 14th full length recording, tentatively titled, ‘The Human Condition’ featuring original compositions as well as standards that speak to her experiences as an advocate and activist for the oppressed and marginalized populations she feels grateful to work with and to call community. “In the vanguard of the best is Eden Atwood, a pretty, willowy woman with a lovely, refreshing voice, perfect intonation, ineffable swing, and a talent for writing and composing.” (Leslie Gourse, author of Louis’ Kids). Music Appreciation Society is honored to have Eden Atwood perform at Baur’s this December and knows that the fortunate audience will be in the presence of Jazz excellence. – “In the vanguard of the best is Eden Atwood, a pretty, willowy woman with a lovely, refreshing voice, perfect intonation, ineffable swing, and a talent for writing and composing.” –Leslie Gourse, author of Louis’ Kids.